The Crow's Roost: Even More Waterfowl! In my last post (on the 19th), I said I'd be exploring the Grand and Red Cedar Rivers a bit more in search of new waterfowl, and that I'd post again if I found anything cool. The weather turned windy and bitter cold, so I did not get to explore as much as I would have liked to, but I did manage to visit a few spots. On the 21st, following a report of two Trumpeter Swans on the 20th, my mom and I headed out to Potter Park to see if we could find them. After several minutes, we saw them sleeping on an ice sheet, standing out against the surrounding Canada Geese. They had their heads tucked in, which made it impossible to make an ID. At one point they briefly stretched and flapped their wings, and I thought I saw triangular, not rounded, bill bases— they were indeed Trumpeters! A great bird for Ingham County! But then I looked at one of my photos and began to have doubts. The bill base looked rounded in the photo, which would make it a Tundra Swan. Unsure of myself, I decided to go back out and have another look. This time, luckily, they were out and about, and I could see that both of their bill bases were undeniably rounded—definitely Tundra Swans. Oh well, they weren't Trumpeters, but it was still very exciting to see non Mute Swans on the river! This photo seems to show a rounded bill base, a Tundra Swan feature. On the 25th my dad and I drove—it was far too cold for walking or biking—to Moores Park. By then, it was so cold that most of the river had frozen over. I thought that most of the area's waterfowl would be concentrated there since, from what I could see, it provided practically the only open water for miles around! As it turns out, it is definitely NOT the only open water in the area (as I found out today) and there was less of a concentration than I had expected. There were still some nice birds, though. Above the dam we found two male Common Goldeneyes, a male Red-breasted Merganser, and four ducks that turned out to all be adult male Redheads! Below the dam was nothing of interest besides the female Bufflehead that's been hanging around there since the beginning of the month. Today, the 29th, my mom and I headed out to a place called Island Park in Grand Ledge. As I had discovered not long ago, the ducks and geese there are very tame and I figured it would be fun to bring a some bread and feed the Mallards and geese. So it was that, despite the frigid weather, I found myself in the Island Park with a loaf of bread in my hand. The waterfowl knew food when they saw it, and within less than a minute Mallards and geese were crowding all around me for a chance at a morsel of bread. The Canada and Greylag Geese fearlessly ate bread straight out of my hand. The Greylags were my favorite, with their array of funny calls, amusing antics, feisty personalities, and—best of all in my opinion—blue eyes. Umm, excuse me, I want food. NOW, MISTER. My favorite part was their blue eyes. ...and many more, including Call Ducks, Duclairs, Buff Orpingtons, and Magpie Ducks! At the edge of the open water I found a great surprise: a dense flock of mostly diving ducks, including a few that I had not yet seen this year. 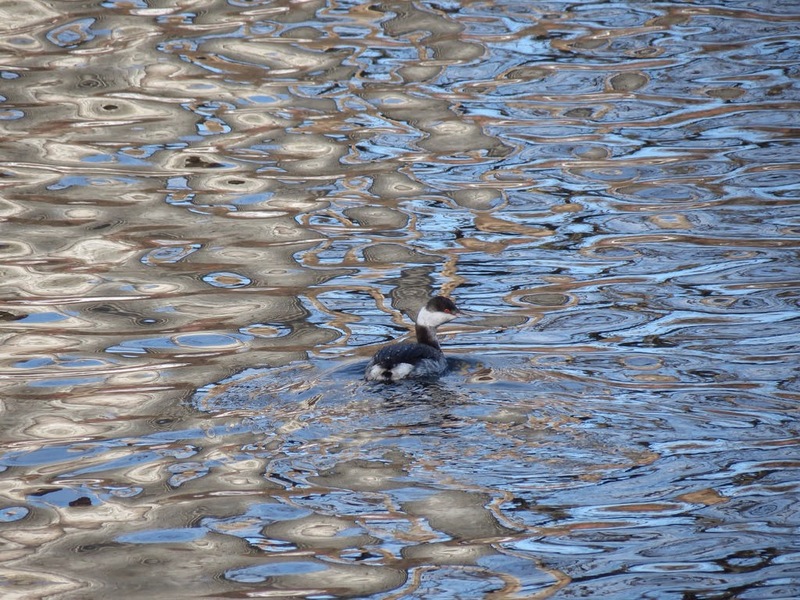 Present in the flock were all three mergansers, Bufflehead, Common Goldeneye, a male scaup, and an American Wigeon. The wigeon was a female, so nothing spectacular—except that she put my January list of waterfowl on the Red Cedar and Grand Rivers at 20! I found it hard to believe that I'd managed to see 20 species of waterfowl on two shallow inland rivers in less than a month. Darn, I thought. But then, while they were flying away, I realized that the male scaup had a LOT of white on his wings. It came almost all the way out to the outer primaries—much more than a Lesser. It was a Greater Scaup, number 22! Even better, I had now seen all of Michigan's Aythya species—Redhead, Canvasback, Ring-necked Duck, and both scaup—on the rivers this month. I could not believe my luck! The Greater Scaup was a great way to end—I will be heading up to Conserve School tomorrow! While I'm there, I promise to blog about the magic of the boreal forest. Not exactly sure where you live but wherever it may be, you're obviously having great waterfowl - and so are we here in TN! We are having a Red-necked Grebe "irruption" in east TN with not just a few but hundreds of them seen, which is a big deal since just finding even one is rare. I still have yet to see one. :) Congrats on placing high in the ABA YBY contest! Wow! Where'd you find all the names for those hybrids?